Located in North-Eastern Italy close to the Austrian border, FC Südtirol is a forward-thinking football club at the heart of its community. 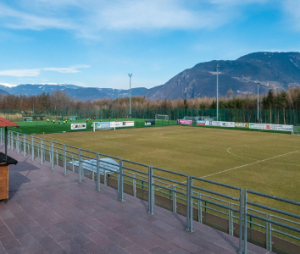 With a desire to innovate and ensure its teams have the best possible facilities as they drive for sporting success, FC Südtirol invested in a brand new centre for its team; opening the FCS Centre in 2018. The FCS Center is located in the Rungg Sports Zone, embedded in the Montiggler forest. The training center comprises a service building, 2 natural turf pitches, 2 artificial turf pitches and another small artificial turf pitch. The total capacity is 47.248 m2 (508.57ft) and is undoubtedly one of the most beautiful sports facilities in Südtirol. As part of the construction and design of the new training centre and club headquarters, FC Südtirol wanted to implement a modern and engaging technology platform to allow the delivery of communications messaging, video on demand and live streams. Currently competing in Serie C, FC Südtirol engaged with renowned Italian technology distributor, Prase, and tech innovator 3P Technologies to investigate how they could create a platform that would grow with the team; Tripleplay’s IPTV and Digital Signage platform was selected. 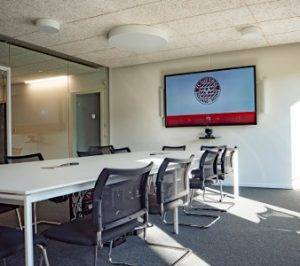 Tripleplay’s IPTV and Digital Signage platform has been deployed in staff offices, media suites, meeting and board rooms, the club retail shop, gymnasium, changing and locker rooms and all communal areas for players and staff to relax. Through the flexibility of the Tripleplay platform and the expertise of the Prase team, FC Südtirol is able to deliver custom messaging to each and every screen, department and area of the new FCS Center; providing an easily adaptable communications method for everybody at the club. 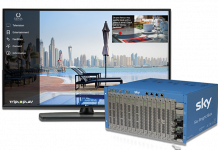 The platform also needed to offer a wide variety of IPTV channels, with the region being bilingual Italian/German, and so Tripleplay’s platform has allowed for the delivery of broadcast TV channels from both regions to wherever needed on site. Tripleplay has also added a new weapon in FC Südtirol’s analysts arsenal. Using the TripleVOD video on demand capabilities of the Tripleplay platform, FC Südtirol is also now able to better utilize video to enhance performance through distribution of highlights, tactical analysis and individual statistics to any digital signage or IPTV endpoint. Through the use of Tripleplay’s Digital Signage platform, FC Südtirol is also able to offer a more visible and attractive advertising medium for its sponsors and partners; enhancing their presence within the club and maximizing the benefits they get from their relationship with the team. Box (STB) delivering to a wide variety of LG’s commercial screens designed to suit their unique environment.